It’s late September and fresh corn is disappearing. What’s available is mature. The cobs are thick waisted and the kernels are portly, more starch than juice. Yet I hate to miss having fresh corn when it’s still available. Time to make a Corn Chowder with Spicy Shrimp! 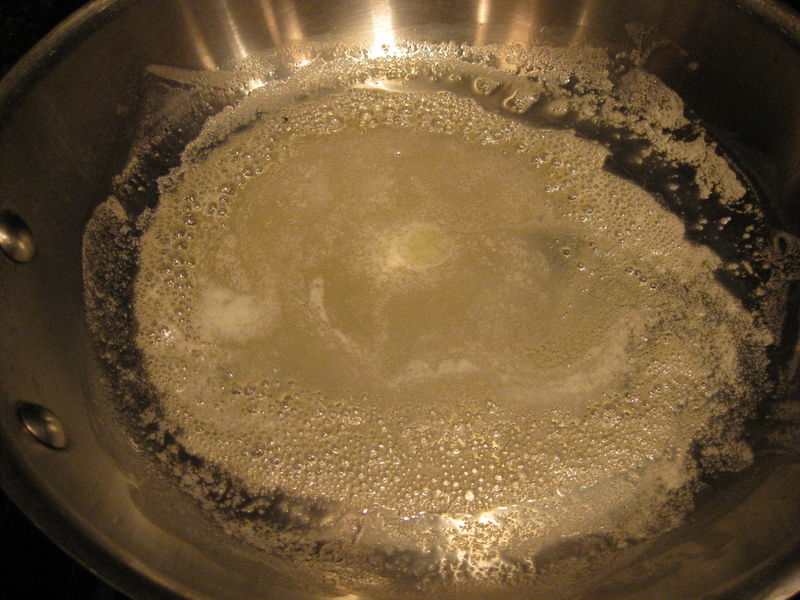 Melt 2 tablespoons butter in a large, covered saucepan or 7-quart Dutch oven over medium heat. 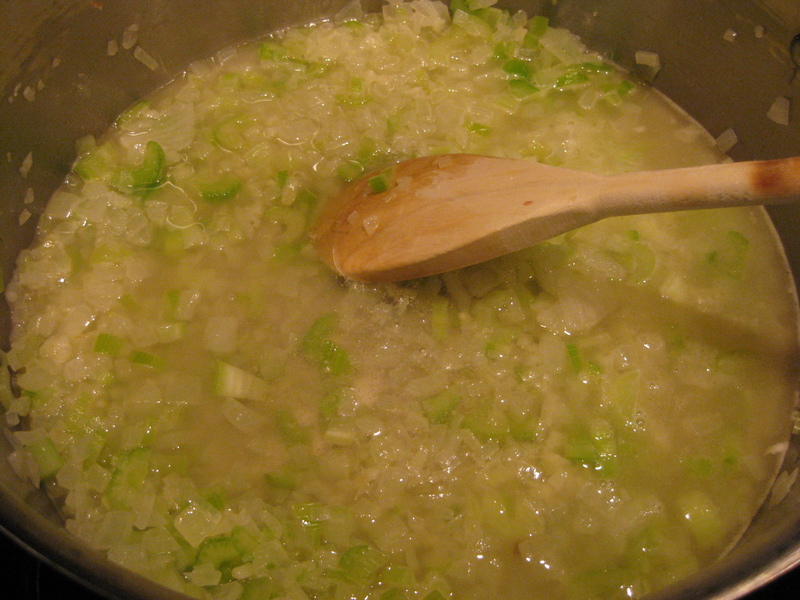 Add the onions, celery, and garlic. Stir to combine, cover the pot, and sweat until translucent about 5 minutes. 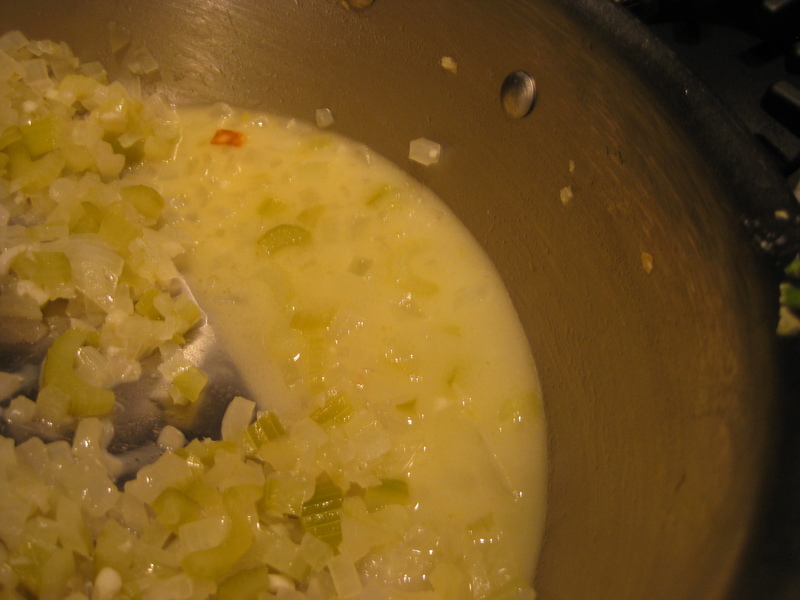 Onions, celery, and garlic in melted butter. 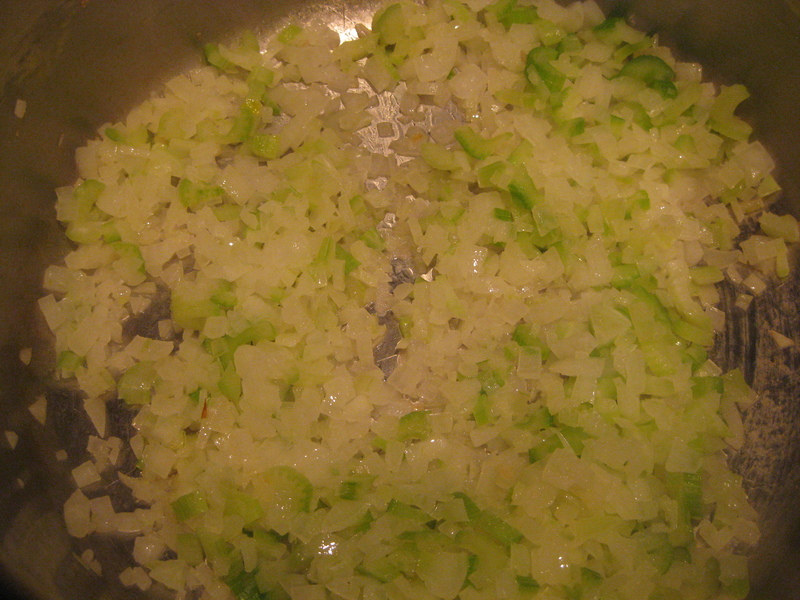 Onion mixture after sweating in covered pan for 5 minutes – note the difference in color and texture. Pour in 2 cups of a dry white wine (not too sweet or too oaky – the flavors will become too pronounced as the wine reduces). Bring to a boil, lower heat to a good simmer, and reduce liquid to about 1/4 cup. Two cups of wine added to onion mixture. Liquids reduced to about 1/4 cup. 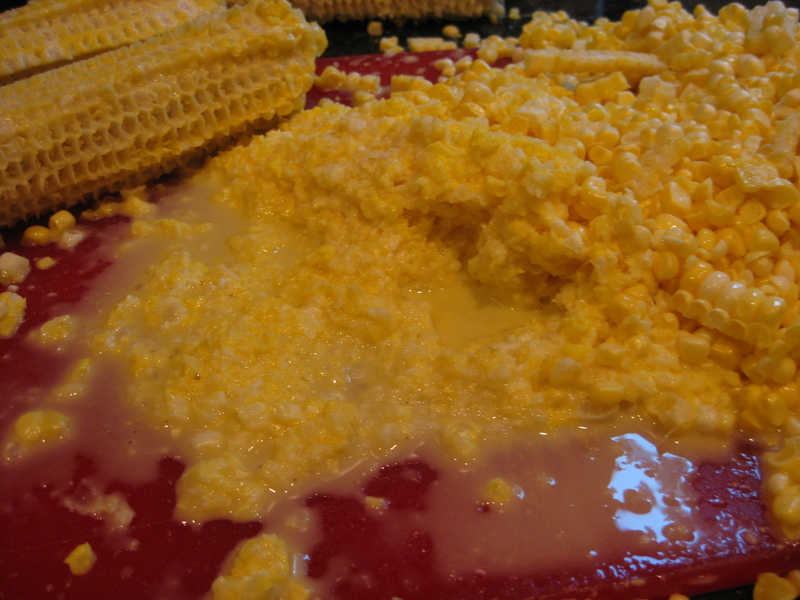 Corn kernels removed with a chef’s knife and “corn milk” released by scraping the edge of the chef’s knife down the cob. 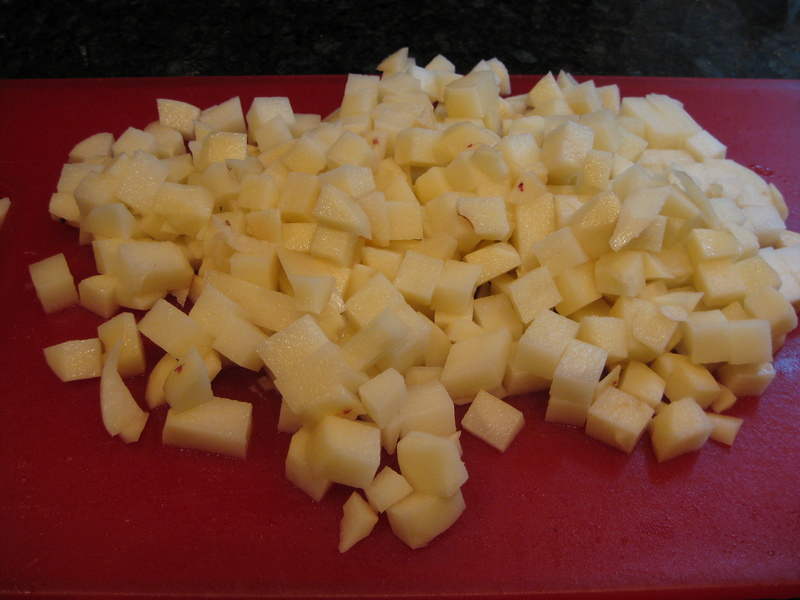 Cut the potatoes into 1/2-inch cubes. If you have French-fry cutter, it’s perfect for this task. Just push those potatoes through and then slice the sticks into cubes. Otherwise, slice the potato lengthwise into 1/2-inch pieces, turn and cut again into 1/2-inch sticks, and then into 1/2-inch cubes. 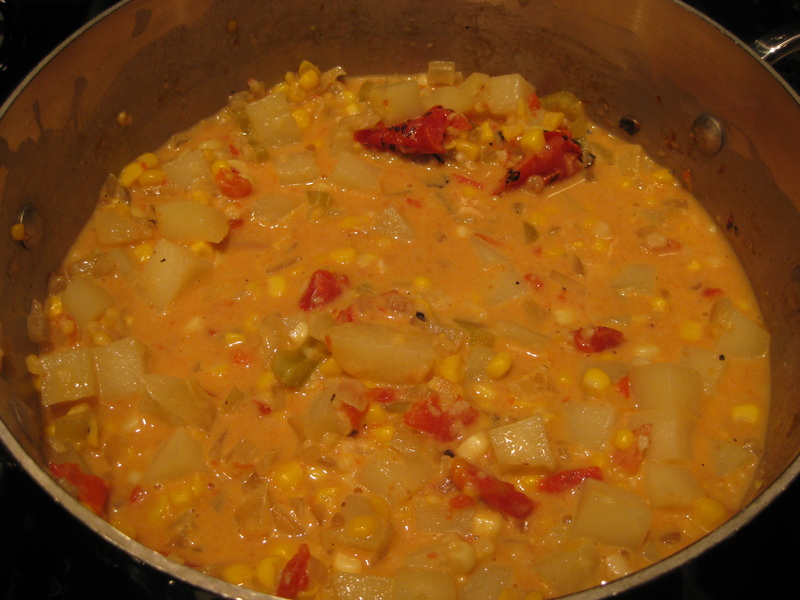 Once the wine has reduced, add the corn, potatoes, stock, tomatoes, salt and pepper. Stir to combine; raise the heat to high and bring to a boil. 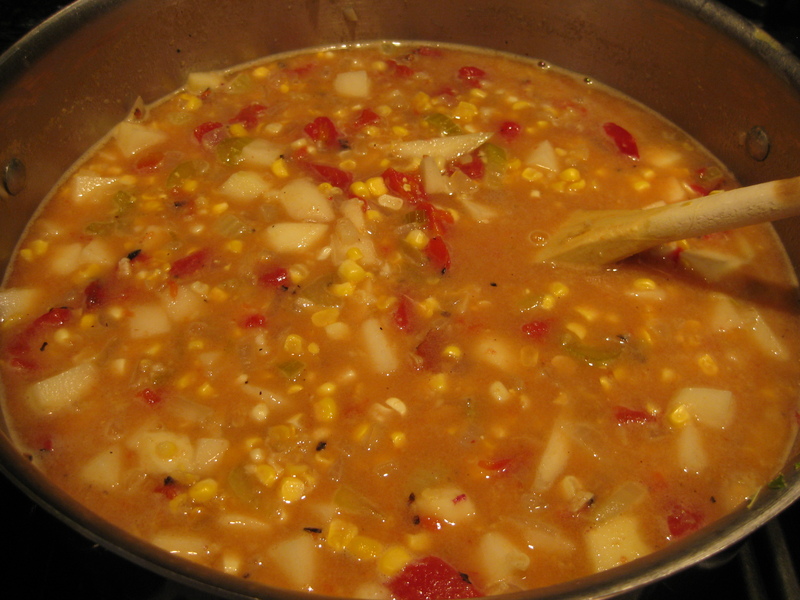 Lower the heat to a simmer and continue cooking until potatoes are tender, about 20 minutes. All ingredients combined and ready to simmer. Stir in the heavy cream and adjust seasonings. The soup is ready to serve, or chill and refrigerate for later use. Dinnertime: If you have chilled the soup, reheat, stirring occasionally; otherwise, keep the soup on a low flame while preparing the shrimp. 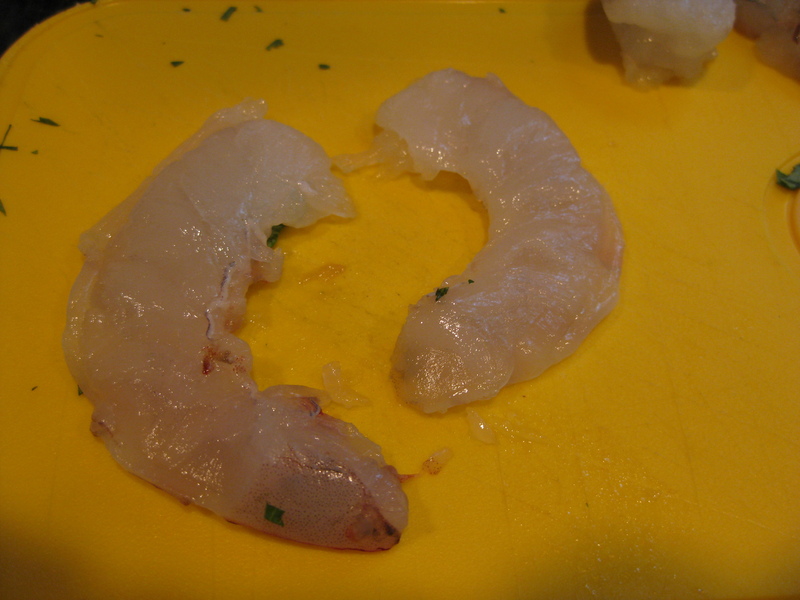 Cleaned shrimp sliced in half lengthwise. 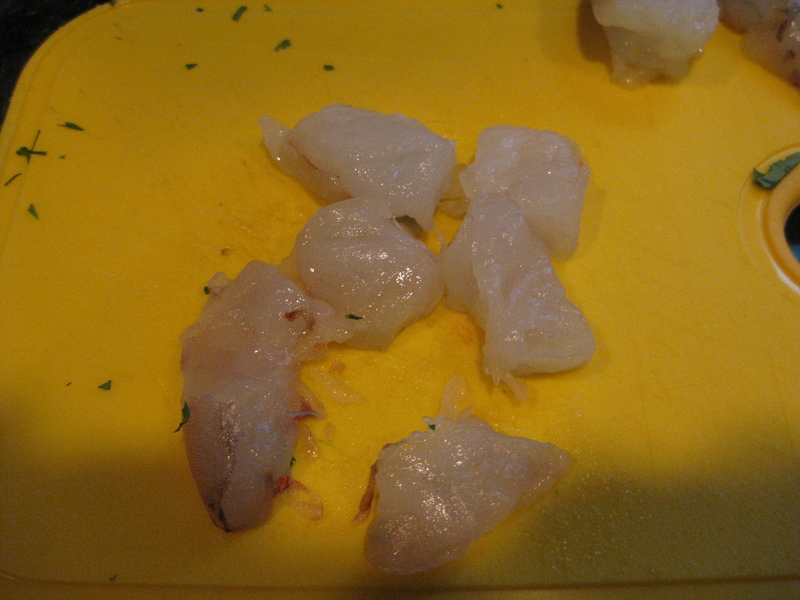 Shrimp cut into bite-size pieces. Shrimp tossed with green-chile-lime rub. Melt the remaining 2 tablespoons butter in a medium sauté pan. When the butter foams, add the seasoned shrimp. Cook until pink and firm, about 2-3 minutes. 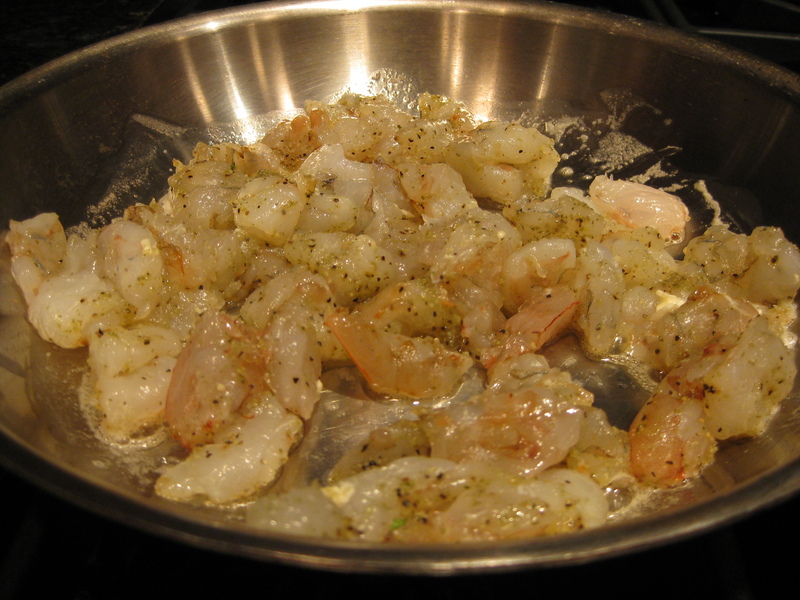 Butter has melted and is foaming – perfect time to add shrimp. 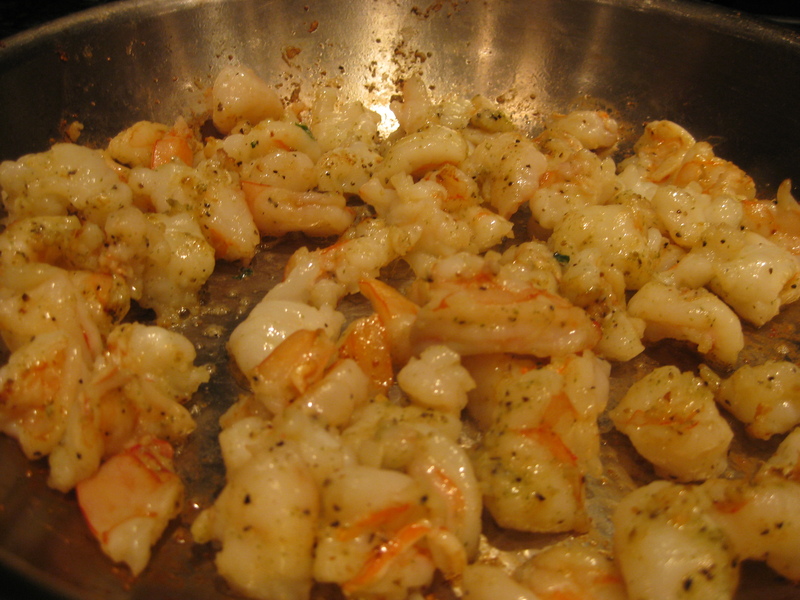 Seasoned shrimp (don’t forget to add salt if your rub is salt free) added to melted butter. 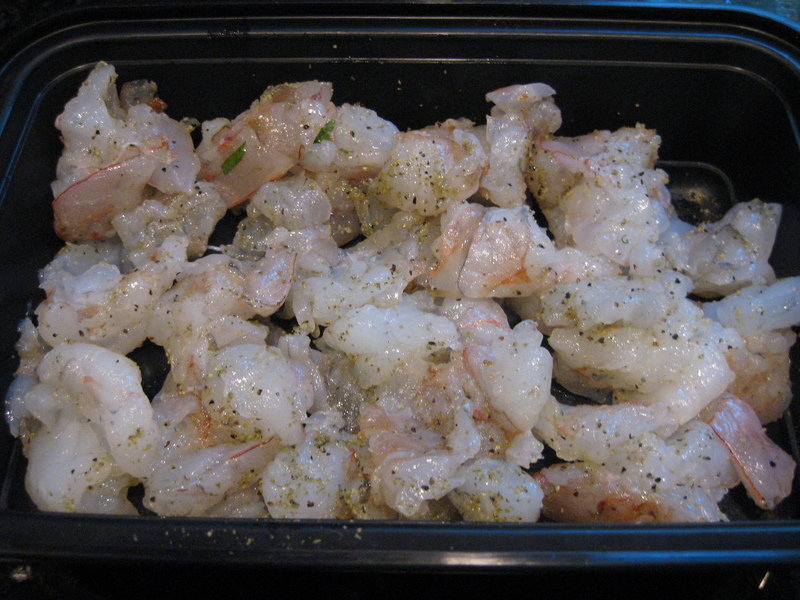 Fully cooked shrimp, ready to add to soup. Melt the butter in a large Dutch oven or saucepot over medium heat. 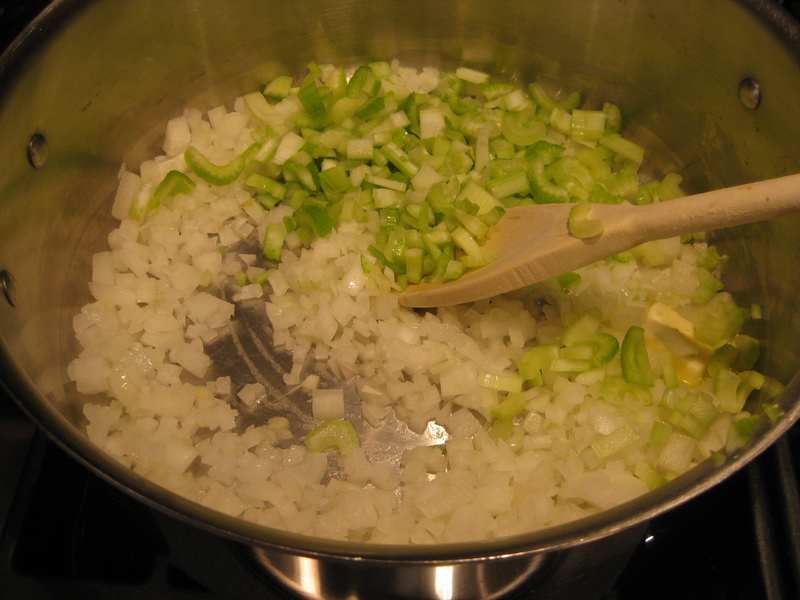 Stir in the onions and celery, cover and sweat for 5 minutes. Add the wine, not too sweet or oaky ,the flavors become pronounced as the wine reduces; bring to a boil, lower heat to a good simmer. and reduce liquid to about 1/4 cup. Melt the remaining 2 tablespoons butter in a medium sauté pan. When the butter foams, add the seasoned shrimp. Cook until pink and firm, about 3-4 minutes. Ladle the soup into bowls, top with the shrimp and a sprinkle of chopped cilantro. For very large shrimp, butterfly and cut into bitesize pieces.